Phewwww.... I finally did it, it's the last day of the Zespri 14-Day Challenge! 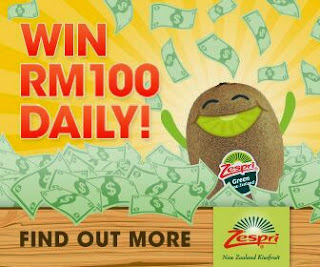 Hi readers, after following me for 14 days on my journey with Zespri, here is a chance for you to change your diet with kiwifruit. Anyway, check it out... Zespri is treating everyone with an amazing daily cash giveaway. Click here for more information. a piece of heaven for Halloween? "Ultraman Live in Pavilion & Genting 2015"